I think it’s possible I’ve rezzed, partially decorated and de rezzed upwards of 20 different houses in the last few months. That is about to change. The main issue was that I was using houses on a platform on my sim TaKe Heart which meant I had to be frugal with prims and I’m not a very stingy decorator when it comes to Land Impact. I could never get the ‘feel’ that I had the right house with the right decor but more than that – it wasn’t in the right place. I needed ground level space for a garden to decorate, real water and a feeling of community. Randomly during a conversation on Friday night a group of us ended up looking at land on a landscaped and themed rental space. “I wish I had a space like this” I said. “Do it” said a friend… “I’m getting this one…we can be neighbours!!!”. It was a spur of the moment idea and soon enough both of us had rented land and rezzed houses and set about decorating our new side-by-side parcels. 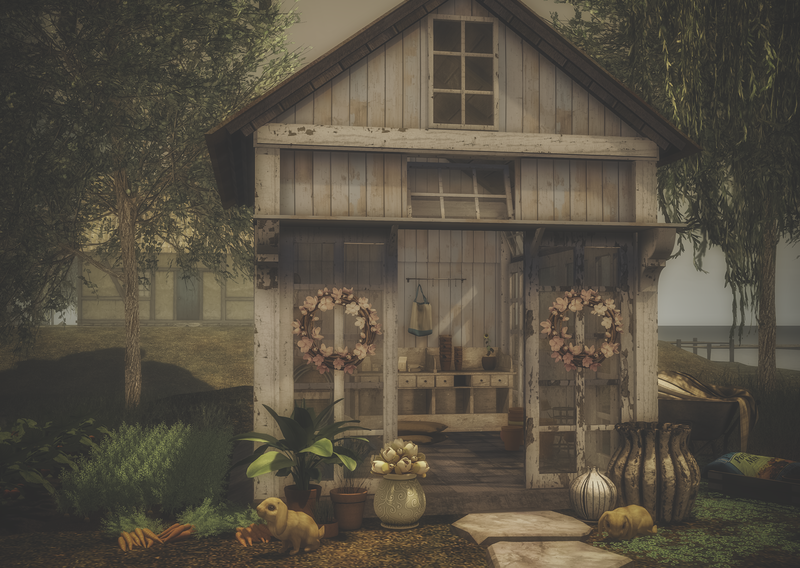 I’m enjoying decorating it way more than I enjoyed setting about furnishing my ‘platform houses’ and while I’m working on the rather large interior I took some time out to complete this lil outdoor gardening area. BVN & TaKe Heart Springtime Photo Contest!